The Hidden Glasgow Forums • View topic - Help! Where is this? Prize to the one who can match it with a recent photo. Partick, heading east from thornwood is my thot. My first thought was somewhere like Cathcart Road????????? It looks a bit like Byres Rd, before the library was built, the first road on the right would be Observatory Rd. At first sight I thought Shettleston Road --- but the left hand bend makes me think Springburn. 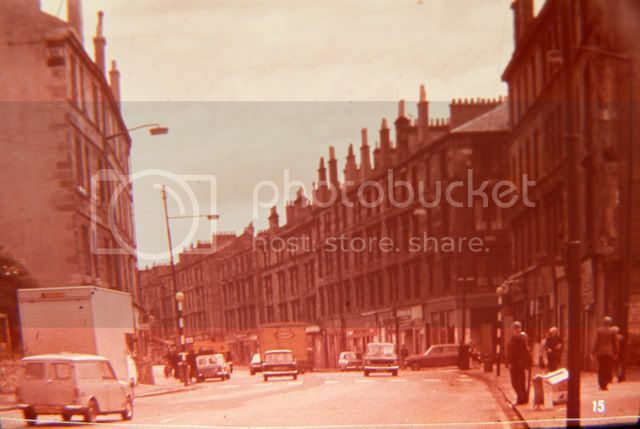 AlanM wrote: It looks a bit like Byres Rd, before the library was built, the first road on the right would be Observatory Rd. Oran Mor would be out of shot just on the left, and you can see the space left after the old garage that stood where the current Sommerfield is now was demolished. The pelican crossing is exactly where the traffic lights are situated now, outside the RBS and Fopp on the other side of the road. ...looking at it again, it can't be Byres Road as the tenements on the right are 3 storeys high, whereas the ones on Byres Road are 2 storeys. While on the subject, can anyone with a SCRAN subscription help me via PM with 000-000-117-500-C and 000-000-118-199-C? my big brother lives on Byres Road and his are three storeys high. sorry...got the pic link wrong!!!!! Is that road not rising as it recedes round the bend, which might in itself preclude Byres Road? I'd also think it's later than the early sixties by the numberplates on the vehicles - they're all the black on white/ black on yellow rather than white on black that would've been prevalent at that time.